I’d like ramble about two things today. 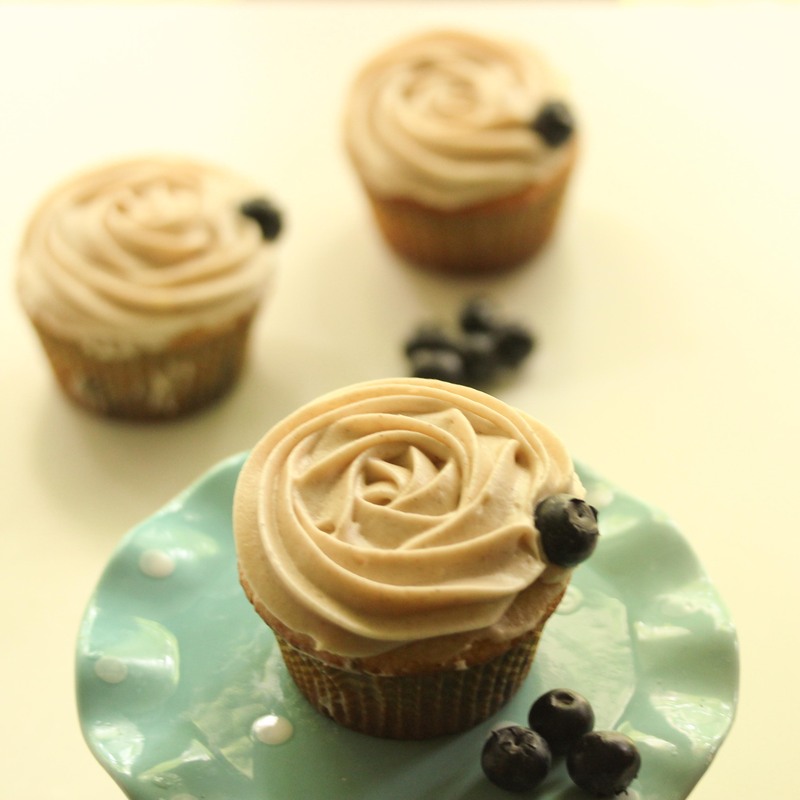 I hope you will bear with me, as these ramblings end in…cupcakes. Do I have your attention? Awesome, let’s start. With blueberries. Is there anything that really screams out “summer” like sitting down to snack on (read: completely devour) a bowl of juicy blueberries? I don’t think so either. I tried to cheat the system a couple of months back, and bought myself a package of blueberries. Many dollars later, I discovered the disappointing truth: for the real goodness of juicy, summery, deliciously plump blueberries, you gotta wait for the summer. Here’s my second rambling. (Patience my friend, we’re getting closer.) Where’s the line between a muffin and a cupcake. I once mentioned that Jim Gaffigan refers to muffins as “bald cupcakes.” And when you think about it, that’s kind of true. Obviously some muffins are barely sweet and definitely not a cupcake, and some cupcakes are so overly decadent that nobody that is of sound mind would ever call it a muffin, even without the frosting, but then there’s all that grey area in the middle. 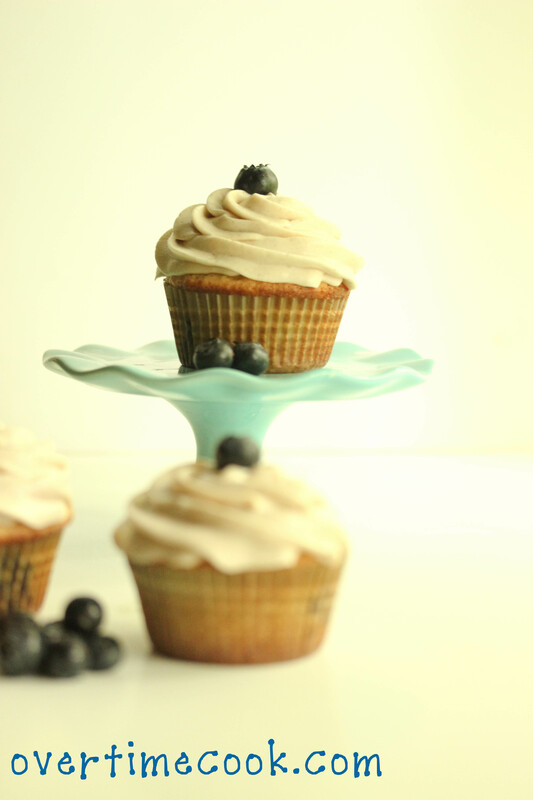 Muffins with frosting, cupcakes without frosting…it starts to get really confusing. Then I pull the cupcakes out of the oven, wait for them to cool, and pipe a layer of dreamy frosting on the top of it. At that point, you give up. Let’s say for argument’s sake that frosting is the defining line between the two. Why do you care? You’re too busy burying your face in the fluffy layer of cream cheese goodness. Preheat oven to 350. Line two 12-cup muffin pans with paper cupcake liners. Set aside. In a small mixing bowl, whisk together the flour (reserve 2 Tablespoons), baking powder and salt. Set aside. In the bowl of an electric mixer, cream the butter or margarine with the sugar until creamy. Beat in the eggs, one at a time, and beat to combine. Add the vanilla extract and beat to combine. Turn the mixer to a low speed and add in a third of the flour mixture, then half the milk, and repeat with remainder. Stir until just combined. In a small bowl, toss the blueberries with the reserved 2 Tablespoons of flour to coat. Gently stir into the batter, using a rubber spatula and not the mixer. Pour the batter into the prepared muffin pans, filling them about 3/4 of the way. Bake at 350 for 18-20 minutes. Set aside to cool while you prepare the frosting. In the bowl of an electric mixer, using the whisk attachment, combine all ingredients and beat until fluffy. Spoon or pipe onto cooled cupcakes. Note: The frosting recipe won’t make enough to pipe a super high layer of frosting on all 24 cupcakes. Either stick to a smaller amount like I did in the picture above, or 1 and a half times the recipe. Are you referring to the top or bottom style? I’m glad you liked these cupcakes. I love how you did the rose piping of the icing and placed the blueberry on the side. Very pretty! 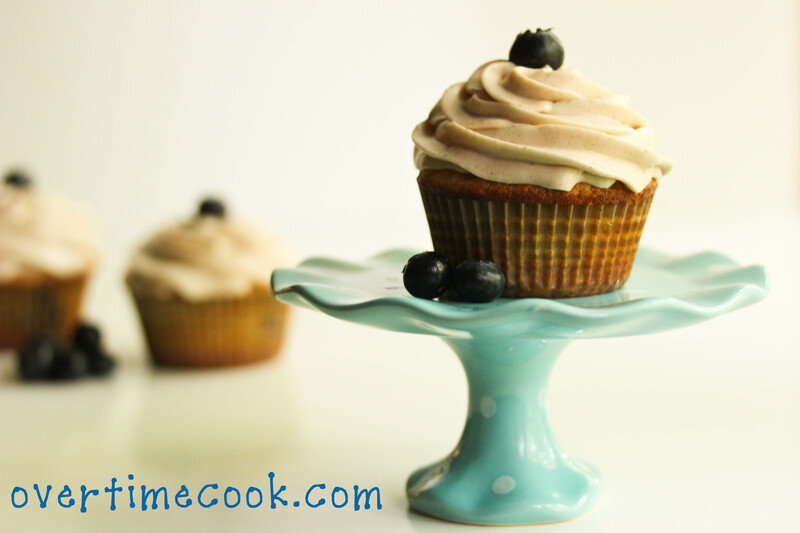 I don’t like blueberries, but I love that polka dot cake stand! These sound delicious..and the pictures are amazing! Love blueberries. I bet these are delicious especially with that cinnamon cream cheese frosting! I’m a sucker for anything with cream cheese frosting. These look heavenly. Will have to try this. These cupcakes look so gorgeous (the lighting and color in the photos is phenomenal). This flavor profile is definitely going to find itself on my to-eat list! I think it’s definitely opening the world of fruit based cupcakes a bit for me! Would you use the same recipe when making muffins? The cake is very different than a muffin texture, also these are sweeter. 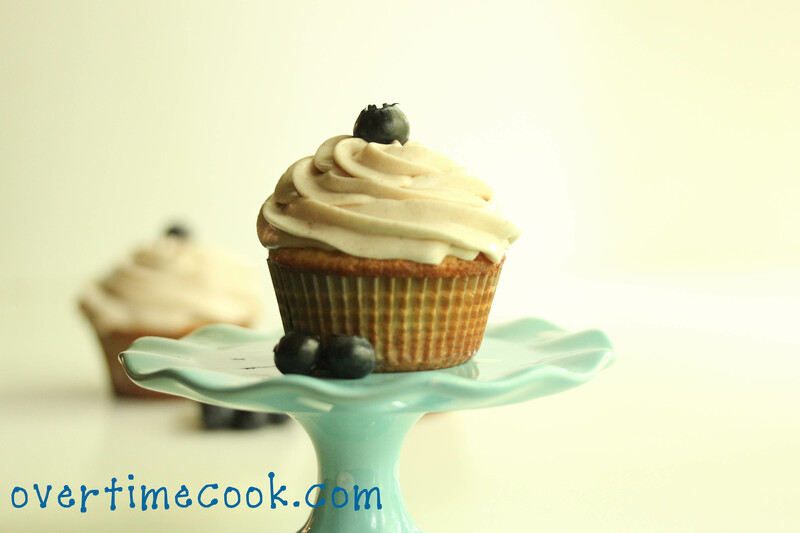 I’ve got a delicious blueberry muffin recipe on my blog, it’s linked in the intro. These look amazing! i have a question though. is it okay to leave the batter until the first batch cooks? or will that do something to it? I’m making this right now.